An important issue in data integration is the integration of semantically equivalent but schematically heterogeneous data sources. 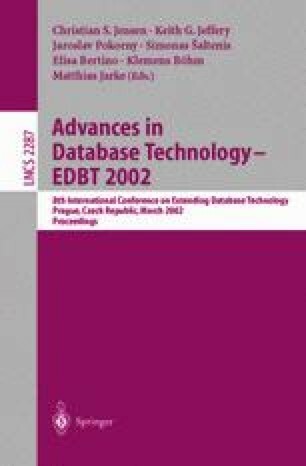 Declarative mechanisms supporting powerful source restructuring for such databases have been proposed in the literature, such as the SQL extension SchemaSQL. However, the issue of incremental maintenance of views defined in such languages remains an open problem. We present an incremental view maintenance algorithm for schema-restructuring views. Our algorithm transforms a source update into an incremental view update, by propagating updates through the operators of a SchemaSQL algebra tree. We observe that schema-restructuring view maintenance requires transformation of data into schema changes and vice versa. Our maintenance algorithm handles any combination of data updates or schema changes and produces a correct sequence of data updates, schema changes, or both as output. In experiments performed on our prototype implementation, we find that incremental view maintenance in SchemaSQL is significantly faster than recomputation in many cases. This work was supported in part by several grants from NSF, namely, the NSF NYI grant #IRI 97-96264, the NSF CISE Instrumentation grant #IRIS 97-29878, and the NSF grant #IIS 99-88776. A. Koeller and E. A. Rundensteiner. Incremental Maintenance of Schema-Restructuring Views in SchemaSQL. Technical Report WPI-CS-TR-00-25, Worcester Polytechnic Institute, Dept. of Computer Science, January 2001. http://www.cs.wpi.edu/Resources/techreports.